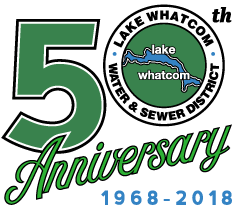 Lake Whatcom Water & Sewer District contracts with Xpress Bill Pay to provide billing and web-payment services for its customers. Payments can be made with your VISA, MasterCard, or Discover with either a credit or debit card, or you can transfer funds directly from your checking account. It’s free to sign up for online bill payment and to use the service. Visit Xpress Bill Pay’s site and click on “Create a free account.” If you’ve already signed-up, you can log in with your email address and password. Go back to Xpress Bill Pay’s site and log in, using your email address and password. The “Add e-Bills” page appears. Follow the instructions to add us to your account. IF YOUR METER IS CURRENTLY LOCKED, DO NOT PAY HERE. If your service has been disconnected, please contact the office at (360) 734-9224 to arrange for service restoration. If this is an after hours unlock there is an additional $150 fee. Business hours are 8-5, Monday–Thursday. If you have received a Disconnect Notice, payment must be received by the final date on the notice in order to prevent interruption of service. Payment is required by 3 p.m. on the 7th. NOTE: Please allow at least 1-3 business days for us to post your payment.